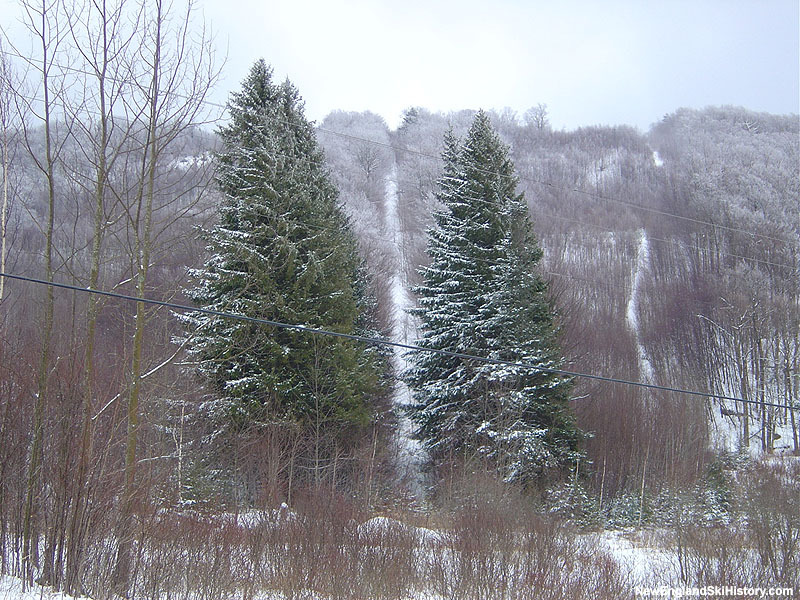 Located off Routes 8 and 100 in southwestern Vermont, 2,470 foot Dutch Hill was once home to a popular ski area. The name was allegedly derived from a carriage road that cut across the ski area, which was used by Dutch settlers during the 18th century. 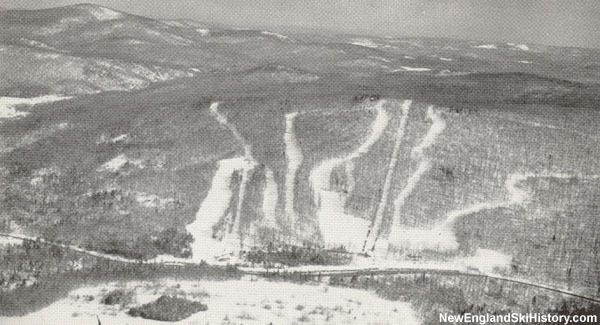 According to the New England Lost Ski Areas Project, Dutch Hill first opened by Webster Ottman and David Allen as a rope tow served ski area for the 1944-1945 season. Edward Dondi and John Pedercini joined the ownership group circa 1945, at which point plans were made to expand the area. It continued to operate with a rope tow for the 1945-46 season. After flying under the radar for two years, Dutch Hill moved to major area status for the 1946-47 season. A 2,000 foot long Constam T-Bar, twice the length of the rope tow, was installed to the top of the hill. The tow was relocated to a novice slope. Meanwhile, the Dutch Boot cafeteria was constructed at the base of the new lift. The popular Dutchman's Holiday trail was likely added for the 1947-48 season, as well as more parking. The uphill capacity of the T-Bar was increased and skiable terrain expanded for the 1948-49 season, to better handle the growing crowds projected from an improved Route 8. The expected crowds showed up, resulting in a then-record 2,000 skiers hitting the slopes one weekend in early February. Trails were further improved via blasting and bulldozing for the 1949-50 season. In addition, a road construction project improved Route 8. Dutch Hill attempted to launch into the technological future in 1950 by purchasing a "Ski Trainer." This machine was supposed to help novices learn how to turn. It is not known how long the experiment lasted. After experiencing some rough winters, trails were smoothed to allow for better skiing with minimal snowfall. Plentiful snowfall in 1954-55 resulted in some more record-breaking days at Dutch Hill. The area's steep terrain resulted in it being known as a little version of Mad River Glen and Stowe. A 1,300 foot long J-Bar was added for the 1958-59 season, serving an expanded Dutch Meadows novice slope on the north side of the ski area. In conjunction with the new lift, the parking area was expanded over to the J-Bar slope, where a new warming hut and snack bar were constructed. 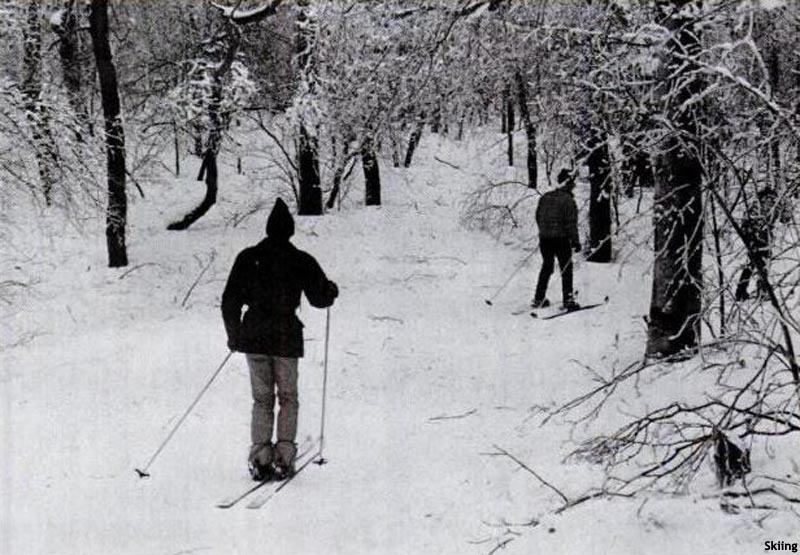 For the 1960-61 season, the long intermediate Dutchman's Holiday trail was rebuilt. In August of 1968, Mel Bredahl and Walter Korder of Connecticut purchased Dutch Hill. The area was then leased to Tony Cersosimo, Dominic Cersosimo, and Harry Pattern, owners and developers of the emerging Alpenwald Alpine Village real estate development across the street. The 400 acre village was advertised as having 200 building lots and was expected to drive a sizable expansion at the ski area for the 1969-70 season. Unfortunately for Dutch Hill, no major projects were undertaken. While the ski area retained its charm, including having the Ts on the T-Bar painted difference colors, it was quietly entering a period of decline. When asked in the early 1970s why the area hadn't installed snowmaking, manager Stan Eames remarked, "we've never had to make snow." Midweek operations were discontinued, which was advertised as a way to keep weekend conditions at their best. 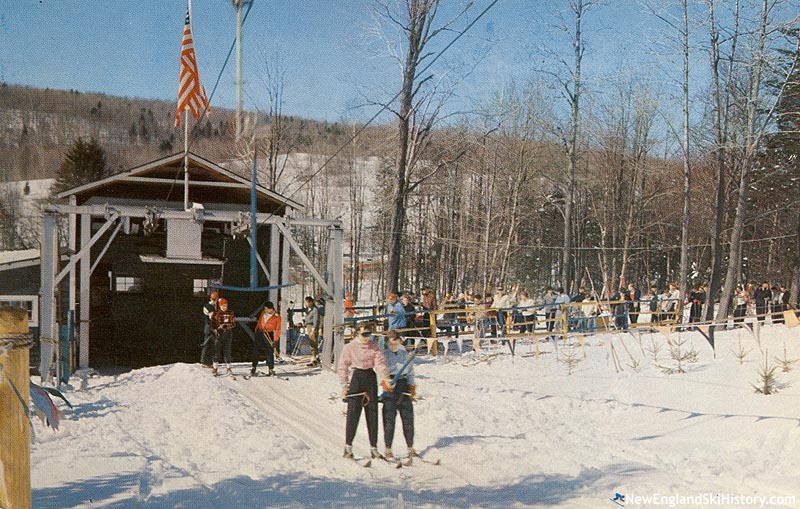 Nordic skiing operations commenced across the street from Dutch Hill in 1973-74, centered at the Heartwellville Lodge. Designed by Don Race, the trails connected to the Green Mountain National Forest. Ski writer John Hitchcock ran a nordic operation based out of the Dutch Hill J-Bar area circa 1977, and later Mike Kennedy operated it during the 1980s. It is not known if the Dutch Hill and Heartwellville Lodge nordic trails were one in the same. In the late 1970s, the ski area was renamed Dutch Mountain for marketing purposes. Circa 1980, manager Steve Whitham left Dutch for a similar position at nearby Prospect Mountain, an area he would later purchase. Meanwhile, Bob (a paper executive in Connecticut) and Harvey Bamman (a cement company founder in Florida) purchased Dutch Hill circa 1981. Also in the early 1980s, the Christiana and Windmill trails were significantly widened. Overshadowed by nearby chairlift developments such as Berkshire East, Brodie, and Jiminy Peak and a victim of lean winters in the early 1980s, the comparatively small and antiquated Dutch Hill closed in 1985. Since closing, the lifts have been removed and most of the structures burned by local firefighters. The area likely became part of the Green Mountain National Forest in 1999. In 2016, the Green Mountain National Forest approved a plan to clear backcountry ski slopes and trails at Dutch Hill. "It's all good wow! I could here my uncle Mike yelling down up and down follow me great times the simple life been there done it! Good Luck"
"Dutch Hill was home away from home for me during the winter months, I would get a pass for Christmas every year from my uncle Mike Catrambone, Mike was the ski school director for many years, growing up on Dutch Hill seemed to be a way of life , I skied there every day it was open and during school vacation, I must say there were many many amazing and expert skiers that learned and skied at Dutch , the challenges of skiing the windmill to te Christie or tucking the whole length of the Holiday ( real leg burner) I could go on and on , I think this is a really great thing to reopen the Mt. I had so many incredible memories there , I still can see all the brown bag lunches on the window sills I think ski lodge and people warming by the fireplace, great I messaged!!!!" "If you could ski the windmill and the Cristina You could ski anywhere A special place where we skied from thanksgiving to easter On 5 to 6 ft of snow a true owner operator family feel Experience Great memories "
"Dutch hill was such a great place to ski, As kids,(1960's) we would ski there every weekend and on occasion, we would side step the Christi to pack it down and in return we'd get to ski the whole day for free. Great memories, the best of times." "I can remember skiing there back in the 50's. I use to ski with the Marra kids. Such happy memories.. too bad that it is gone "
"I grew up skiing there every weekend. I started in the mid 60's and the last time I went there was in the early 80's. That was the BEST family ski area during that time, hands down. The only trail I never took was the Windmill, but it was only because of my skill level. The area was like an extension of one's own family. Never in my wildest dreams did I ever think that I would end up living smack dab next to the old girl, abutting the area just off Rue Madelline. I still hike and hunt the area, and every time I go there is like old times.......GREAT old times!" "I skied at Dutch hill as a kid and worked there in the early 70's. The owners were totally hands on with Terri my boss running the passes,tickets and the lodges and restaurants (snack bars). The people who got season tix were like family and the years of growth of their kids were measured by the trails they could conquer. The Windmill was a very serious straight drop, and a few of the serious downhillers were send advance scouts out to warn us : 'Terry Davignon is coming, stay on the right side, or 'Dave Casey is coming, stay on the left' It was like front row to a downhill competition, and within a minute you could look up and see em coming, and flash they were gone and down to the bottom. It was civilized and great skiers would ski there." "I first skied Dutch Hill about 1952, my senior year in High School in Putnam County, NY. The trip there tended to be quite cold in my 1951 Ford convertible. After being discharged from US Army in 1959 I skied there again. In the early 70's I took my 2 young sons there and they still have fond memories of skiing there, even in the fog of late spring." "This was our late season Mecca. We would ski our local rope tow hills til closed then go to DH. As a little kid the T bar was mostly an aerial ride til we finally fell off and had to ski the daunting Christiana trail down. Great place. Great memories."